We often focus on the path ahead of us. Traversing the path of life as a woman in technology requires intelligence, diligence, and a great sense of humor, so our forward-looking focus makes perfect sense. We focus on tomorrow and how much work there is yet to be done. It’s true that there is still much work left to be done to achieve gender equality in technical disciplines, but I think it’s worthwhile to stop for a moment to look backward and reflect on how far we’ve come. – My Grandfather, commenting on women who worked in highly technical jobs previously held by men during WWII. I was taking a sip of wine as he told me this. Although I didn’t get drunk or disorderly, I genuinely enjoyed the irony. 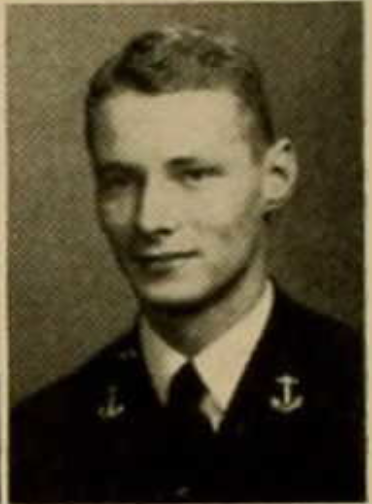 My grandfather studied Electrical Engineering at the US Naval Academy from 1947 – 1951. Here is his 1949 yearbook picture. I’m biased, but I think he’s adorable. I asked him whether there were any women studying engineering when he was in college. His response was that in the 1940’s, women didn’t go to college to get a degree — they went to college to get married. At this point in the conversation, I came precariously close to getting disorderly, and I had to remind myself that he was simply relaying an antiquated social perception. In the early 20th century, many of the women who graduated from college did, in fact, get married promptly after graduation. The truth is, they were faced with a very difficult decision: either have a family or pursue a career. The idea that a woman could work outside the home and raise a family was inconceivable at that time. Growing up, I never would have considered myself a feminist. My head had been filled with many negative stereotypes associated with feminism. My understanding was that feminists were angry, ugly, miserable old spinsters who hated men (and everyone else, for that matter). What were they so mad about, anyway? They had achieved their goals. Women were on equal footing with men now. I felt empowered to be the master of my own life. It wasn’t until I graduated from college and entered the work force as a computer engineer that I realized that while I was the master of my own life, there were a surprising number of men throwing road blocks in my way. Now, I’m proud to call myself a feminist. I’m happy to report that I’m not angry, ugly, or miserable. I’m also very fond of men (and everyone else, for that matter). To me, feminism is all about the freedom to make choices and live them out in a peaceful, supportive environment. Maybe you choose to work. Maybe you choose to raise a family. Maybe you choose to wander the earth searching for the meaning of life. (Please tell me if you find it.) Likely, you choose to do a combination of those things. While I do believe that many women in the US feel empowered to own important decisions regarding their lives, the level of support we get in living out these decisions still varies greatly. The Northwest Regional Women in Computing Conference is all about increasing that level of support for women in technical disciplines, and that is why it is so important to me. As we celebrate women in computing and all who support them, let us remember that we have come a very long way in the last 66 years. While our individual efforts may seem small, they are important contributions to a much larger movement. Let us remember the women who fought hard and made personal sacrifices for our freedom to choose our own destinies. As we move forward, let us draw strength from their example. Let us keep our mission close to our hearts. Let us wake every morning with a smile and the knowledge that, like our predecessors, we will drive monumental social change for women over the next 66 years.